Gilchrist, of Somerdale, Camden County, poses with his mother, Cindy Richardson, and stepfather, Vincent Richardson. "His gift is basketball," his mother says. They all wanted to know one thing: How good is he? On a recent humid Sunday afternoon, basketball fans packed the Rutgers-Camden gym to watch the effortless play of Michael Gilchrist. The 6-foot-6 swingman did not disappoint, swatting away four of his seven blocked shots in the first four minutes of the AAU contest. Weighing only 180 pounds, Gilchrist used his 83-inch wingspan to routinely outrebound taller and heftier opponents. He also scored 13 points thanks to 6-for-6 shooting on an array of crisp mid-range jumpers, put-backs and contested layups. "Some people already have him in the NBA," said Aaron McGlawn Sr. of Cheltenham, one of many impressed fans. "That boy is good." No matter how good he is, Gilchrist won't grace an NBA roster for at least five seasons. Nor will his fans be able to spot him in a major-college game any time soon. This fall, Gilchrist will be one of the youngest ninth graders at St. Patrick High School in Elizabeth, N.J. At 13, the resident of Somerdale, Camden County, who started school a year early, recently graduated from Somerdale Park School. The projected 7-footer has three-point range and is a dominant defensive presence. "Based on watching high major-[college players] and NBA kids, Michael fits the same profile as O.J. Mayo, Greg Oden and Kevin Durant" as rising ninth graders, said Spencer Pulliam, founder and publisher of the Generation Next Basketball recruiting service. "He has everything you want in a prospect." Time will tell whether Gilchrist can become an NBA lottery pick like Oden (taken first in the draft last week by Portland) and Durant (chosen second by Seattle), or recognized as the top incoming college freshman like Mayo at Southern California. But Gilchrist said he did not aspire to be just as good as Oden, Durant and Mayo. "My goal is to the best [swingman]" on his high school team, he said. "Then I want to play [college basketball] at Memphis for two or three years. I don't want to do only one year in college, because I want to get an education. And after two or three years, hopefully, I can go to the NBA." For now, he is one of the nation's top incoming high school freshmen. Make that a quiet and assuming freshman. Even with his superior skills, Gilchrist doesn't like receiving extra attention and is prone to shy away from discussions about his talent. But he might have to get used to the extra attention. Pulliam lists Gilchrist as the nation's ninth-ranked player in the Class of 2011. Hoop Scoop rates him as the 12th-best incoming freshman. He participated in the recent Fab Frosh Camp in Chantilly, Va., which showcased the nation's top 150 incoming high school freshmen. "For a young player, he already has the things you look for," said Clay Dade, a former NBA scout who founded the camp. "Do they love the game? Do they have the passion for playing? He has the Kevin Garnett quality that you can't turn off. He has a remarkable attitude, and he's very coachable. "His approach is, 'Hey, I want to be coached. I want to be better, and I want to be great.' "
Dade said Gilchrist reminded him of a young Durant, a 6-9 swingman who played one season at Texas. Durant became the first freshman to be named Division I player of the year. Gilchrist said he tried not to listen to the comparisons or read the rankings. "It just doesn't matter to me," he said. "I just want to have fun." For now, just having fun is what his mother, Cindy Richardson, and stepfather, Vincent Richardson, want him to do. They know success isn't guaranteed. Cindy Richardson's brother, Darrin Kidd, was a standout guard at Sterling High in the mid-1980s. Her first husband, Michael Gilchrist, was a star guard at Camden. Kidd did not play basketball in college. Michael Gilchrist's father did, accepting a full scholarship to Benedict College in South Carolina. But unlike his former high school teammates, Milt Wagner and Billy Thompson, he never played in the NBA. Michael "Gil" Gilchrist was killed 11 years ago in a violent crime. Because Gilchrist's homicide remains unsolved, the family did not want to address the case in detail. The Richardsons want to keep Michael protected and grounded in basketball. They don't want him to believe the hype. His mother and stepfather did not want Gilchrist's picture posted on the Fab Frosh Camp's Web site because they felt the added attention would be too much for a 13-year-old. They also turned down invitations to elite basketball camps. And they're not afraid to pull him out of a game or tournament if he doesn't want to play. "We feel like, at this time in Michael's life, his gift is basketball," Cindy Richardson said. "As parents, it is our responsibility to nourish his gift, but from a very realistic perspective. And Vincent and me do that from a very old-school twist." 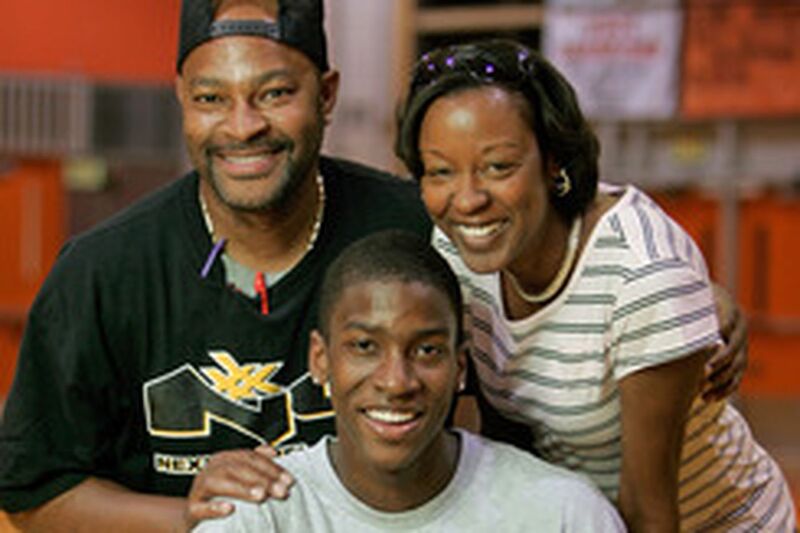 Hoop Scoop's Clark Francis believes the Richardsons' guidance will benefit Gilchrist. "Since his mom has him grounded, he is less likely to get caught up in the hype," Francis said. "He can end up being in the top five" in the national rankings by the time he graduates from high school.